This award honors efforts to increase transportation choices for all populations, reducing dependence on private automobiles and helping to ease congestion and reducing climate change impacts. The National Planning Award for Transportation Planning (Gold) recognizes the digital map developed by the Planning Department to support its data-driven Bicycle Master Plan, which is anticipated to be completed in 2018. The Bicycle Stress Map is a publicly accessible tool located on the Montgomery County Planning Department website at www.mcatlas.org/bikestress. 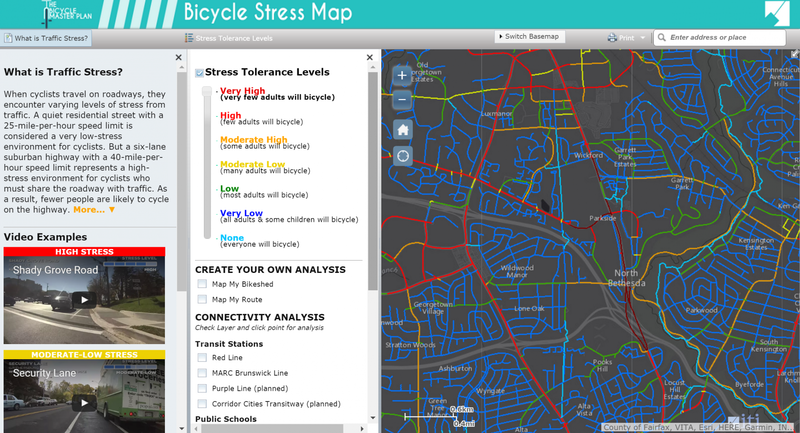 It shows the stress levels encountered when bicycling in different areas of Montgomery Count, from very low stress (appropriate for children) to very high stress (appropriate for only about one percent of adults). Videos linked to the map explain the experience of bicycling in areas with different traffic stress conditions. The Bicycle Stress Map was launched in April 2016 and has been widely embraced by decision makers and the public for highlighting how difficult it is for the average person to travel by bicycle in Montgomery County. While most adults could bicycle on 78 percent of the road miles in the county, only about 20 percent of trips can be completed on a low-stress bicycling network. Creating the map required the Planning Department to assign a level of stress experienced by bicyclists on more than 3,500 miles of roads and trails in the County. In honoring the map, the APA recognized that this tool can used by other jurisdictions to evaluate bicycle routes and build support for new bikeways. Already, the Montgomery County Planning Department has been contacted by planners throughout the country, from Delaware to California, who are interested in preparing similar tools. At the start of the Bicycle Master Plan process, the Montgomery County Planning Board Chair publicly challenged the planning team to create “the best bicycling plan ever.” The Bicycle Stress Map is one part of the Planning Department staff’s response to this challenge. The Bicycle Stress Map has already yielded results even though the master plan is not yet complete. It helped to secure $6 million from the Montgomery County Council to fully fund a network of separated bike lanes in Downtown Silver Spring, one of the first planned networks in the nation. The map will continue to be of value to Montgomery County by helping to prioritize recommendations in the Bicycle Master Plan and by showing the value of each planned bikeway. Learn more about the Bicycle Master Plan.